What is the nuclear fusion? A prototype of the nuclear fusion system that relies on coils and compressing magnetic fields to produce energy. If new computer simulations pan out in the real world, nuclear fusion, the power source that makes stars shine, may be a practical possibility here on Earth, scientists say. Simulations at Sandia National Laboratories in New Mexico revealed a fusion reactor that surpasses the "break-even" point of energy input versus energy output, indicating a self-sustaining fusion reaction. (This doesn't break any laws of physics for the same reason that starting a fire with a match doesn't). Extremely high temperatures and pressures are needed to spark nuclear fusion, a process in which atomic nuclei — the protons and neutrons of atoms — literally fuse together to create a heavier element. And if the conditions are right, that fusion can release massive amounts of energy. The results of the new study have applications in weapons testing (it's feasible to test the effects of nuclear weapons in the lab, but not in the real world) and for clean energy, as the experiment relied on deuterium, which could be extracted from seawater. In stars, the mass of hydrogen is so large that its own gravity keeps the hydrogen and helium at the center in a small area, and the temperatures are in the millions of degrees. 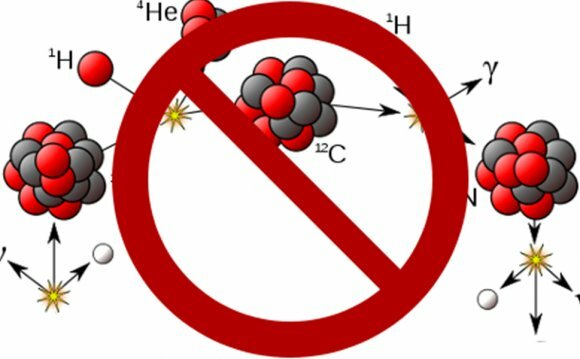 Essentially, the plasma (gas that has had its atoms stripped of electrons) is confined forever, and the protons can't escape and take their energy with them. So hydrogen fuses into helium, producing a lot of energy in the form of light and heat. But that's a lot more difficult to do in a lab. For years, scientists and engineers have been looking for ways to confine plasma that is so hot it would melt the walls of any container and force atoms together to make them fuse. At Sandia, they are testing a method called magnetized inertial fusion, in which two coils are used to generate a magnetic field. Rather than a solid container, this magnetic field confines the plasma. That current vaporizes the liner, but before it does so, it generates a very strong magnetic field nestled inside the one from the coils. As such, the outer magnetic field squeezes the liner with so much force that it shrinks to a small fraction of its original size. That crushing force is enough to get the deuterium and tritium atoms confined long enough to fuse into helium, releasing a neutron and some extra energy. The method, which is different from the controversial cold fusion in that temperatures go well above room temperature, was first proposed by Sandia researchers Stephen Slutz and Roger Vesey in December; they published their work in the journal Physical Review Letters. In their computer simulations, the output was 100 times that of a 60 million amperes put into the system. The output rose as the current went up: 1, 000 times the input power was reached from an incoming pulse of 70 million amps. Even at Sandia, there isn't a machine that can generate such a huge pulse of energy. The Z machine, a powerful X-ray generator, can hit about 26 million amperes. That might be enough, though, to prove the concept works by hitting the break-even point, where the energy put into the reaction is the same as that which comes out. Sandia scientists are currently testing the different components of the new machine; right now, they are working on the coils, but a full-scale test should happen in 2013, they say. Of course, it is still uncertain whether the reaction will work the way the researchers hope. Instabilities that appear in the magnetic fields that contain the plasma, for instance, have been an obstacle to working fusion power plants. Those instabilities allow the plasma to escape, so it doesn't fuse. But the work at Sandia is a step in the right direction, said Stephen O. Dean, president of Fusion Power Associates, an advocacy group that has pushed for development of fusion energy. "They are working at a higher density than other fusion experiments, " Dean told LiveScience. "So there's more classical physics… it's better understood." Other approaches, he said, such as using lasers to force deuterium nuclei together, produce interactions that have not been studied as extensively. Though this work is ostensibly to test weapons, Singer acknowledged its application to power generation, and that it would be a big step. Física "Fusión y Fisión Nuclear"